Several weeks ago, I did a program at my library for upper elementary students (grades 2-5) called Stories Under the Stars. I totally stole the idea from a librarian on PUBYAC (thank you!!!). My coworker M and I learned the myths behind several constellations and did an oral storytelling program sharing those myths with the kids. We included the Greek myths and some Native American tales for constellations like Ursa Major, Cassiopeia, and Orion. We used several books to find the stories including Stars of the First People by Dorcas S. Miller and Dot to Dot in the Sky: Stories in the Stars by Joan Marie Galat. First, I decorated the room with glow-in-the-dark stars. I created posters with the constellations that we'd be talking about, using glow-in-the-dark paint for the stars. As we told the stories, we showed kids the constellations and then at the end of the program we turned off all the lights so they could see the constellations glow. If I could make the posters again, I'd make the glow-in-the-dark parts bigger because the littlest dots didn't show up so well. The first part of the program (about 30 minutes) was storytelling and then we made constellation window hangers for a craft. The craft came from the book Crafts for Kids Who Are Wild About Outer Space. Pour glue into the plastic lid and fill it up (but not so the glue spills over). Add a few drops of food coloring and mix it up with the craft stick so that you have blue glue. You really only need two or three drops of food coloring. Make a loop out of one piece of yarn or string and place the knot into the lid, pressing it down into the glue. Make sure the knot is covered in glue. When the glue dries, you'll take the star-catcher out of the lid and hang it by the yarn loop. This was the hardest part for the kids and I think M and I ended up tying almost all the knots. We had some random c onfetti on hand from various projects and I went through it and pulled out the star-shaped bits. If you don't have star confetti, punch out small stars from aluminum foil. You'll use the stars to make your constellation by putting them into the glue in the lid. Use the craft stick to press them down into the glue. We provided paper and pencils in case kids wanted to sketch their constellation before putting the stars in because they're hard to move around once they're in the glue. Since the wet glue is opaque, the stars look like they are disappearing, but when the glue is dry it will be clear and you'll have your constellation hanging in a blue sky. If you are brave, you can use some glitter to liven up your sky. It took several days for the star-catchers to dry, so you may want to have kids leave them at the library until they're easier to transport. Pry them out of the lid very carefully! Or you can leave them in the lid - they still look nice that way. This would be a great program to try this year because 2009's the International Year of Astronomy! Make sure you have lots of space books on hand for this kids to check out (like one of my favorites, The Mysterious Universe). 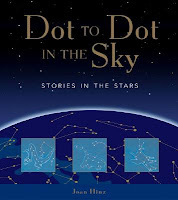 I'm glad you found my book - Dot to Dot in the Sky, Stories in the Stars useful! I enjoyed reading about your starry event. You might be interested to know I have written four books in the astronomy/mythology series. Dot to Dot in the Sky, Stories in the Stars.